Not off the deep end judging by some of my recent posts. This is not as shallow as some may suspect either. 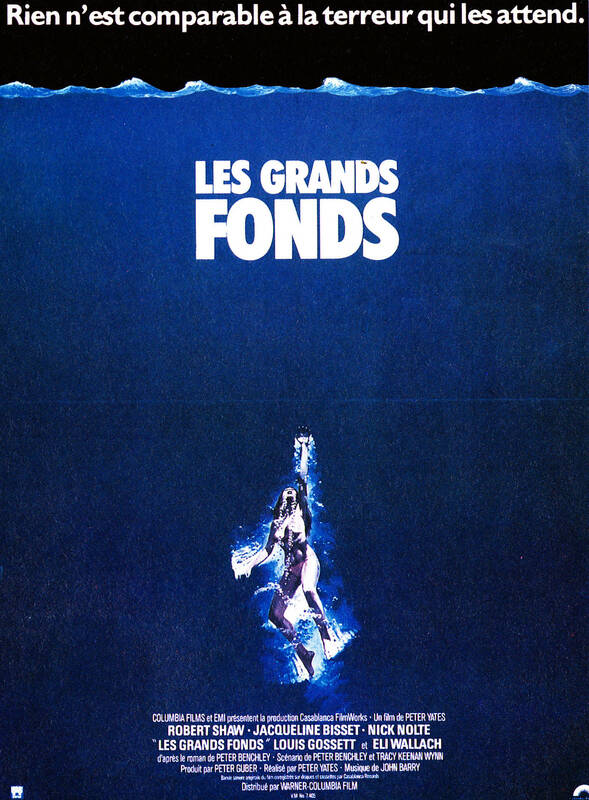 (applause) What the hell is Le Grands Fonds anyway? I speak English, not Greek. Here is the cinematic version of Peter Benchley’s novel. Producer Peter Guber boasted about Jacqueline Bisset’s clingy, wet, white top: “That T shirt made me a very rich man.” She was paid $200,000 to flaunt her body and it worked. Big time. For the studio suits that is, not the actress. From a 9 million dollar budget this film grossed over $47 million at the time. I know younger viewers would prefer Into The Blue, but that is just a more glossy rip off of this old thing. While wreck diving off the coast of Bermuda Anglo-American couple David and Gail discover a ship not found in the guide book. It is the Goliath; a second world war era ship that was carrying a large quantity of explosives.It was also carrying several thousand ampoules of morphine. One of these ampoules is taken back to shore by the couple and this makes them a target for local mobsters. A Mr Henri Cloche esquire, a gentleman from Haiti, wants the ampoules because of the drugs they contain and is willing to do what it takes to get them. David and Gail aren’t that interested in the morphine though, they are more interested in a medallion they found on the site. It is much older than anything on that ship should be. They take it to local treasure hunter Romer Treece (Robert Shaw) and eventually they determine that there are two wrecks there: The Goliath and a French vessel called the Griffin, which was transporting treasure as well as her declared cargo. Further dives produce more treasure but if they are to prove it is the lost Spanish treasure they will have to find an item from the list of lost pieces… they will also have to avoid sharks, Cloche’s henchmen and a particularly mean moray eel. Talk about in your face! I expected this to be another dangerous underwater animal film being rushed out to cash in on the success of ‘Jaws’ but thankfully it was much better than that; it is really a decent treasure hunting adventure with some drug dealers thrown in to the mix to increase the suspense. Its a feast for the eyes as well. Nick Nolte and Jacqueline Bisset give reasonable performances. He is better than she when it comes to believable acting, but it is Robert Shaw who steals the show as Treece; a character that isn’t dissimilar to the role he played in ‘Jaws’. A grizzled former sea captain never far from a bottle of rum. There are also notable appearances from the devious-looking Eli Wallach, badly in need of a shave. Plus a jovially menacing Louis Gossett Jr. The underwater scenes are well shot and when there is action it looks confused enough to feel real. Above water there are some nice shots of Bermuda but it never feels like it is trying to act as a tourist brochure by showing all the best sites. The story is fairly simple but it is told well and there is a good amount of action… including a rather scary scene where somebody is attacked with an outboard motor! There are also a couple of references to real Bermuda treasure; the gold and ruby cross is a clear reference to the gold and emerald ‘Tucker’s Cross’. The whole adventure is capably handled by director Peter Yates, an underrated talent. Anyway, I’ll shut up now. You just enjoy those waves and let Donna Summer roll all over you. Speaking of that late, great, lady – here she is posing in an unconventional manner in the shot below. « If You Are Stressed Why Not…. I like your review style, Geoffrey. Would love to have you also share your reviews on reviewcreep.com and get you some free exposure. The easiest way to get started is by using your existing review blog posts since you’ve already done the work… just enter your wordpress blog url when it asks for it during the quick signup… it will make it easy to add all your existing reviews. Our marketing team is going to be sending out the top reviews in a daily/weekly curated email to our entire list.